Don’t be fooled to take the court’s own recommended DUI course that charges twice the price. 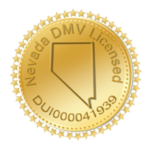 Just like the court’s DMV licensed online course, our courses also are Licensed by The Nevada State Department of Motor Vehicles! For individuals charged with a first offence DWI/DUI, this Level 1 DUI course satisfies Nevada DMV and Court requirements for drug or alcohol tickets that you receive anywhere in the State of Nevada. Once you click on ADD TO ORDER, scroll down to the end of the page to enter your credit card information. Our flat rate of $95.00 includes everything you need with absolutely no hidden fees. Download your free Certificate immediately upon successful completion to print, fax or email to the court. Guaranteed to pass! Not only can you retake the final exam unlimited times at no extra charge or wait time……but if you get an answer wrong, just review your quizes and final exam test- you will immediately see any incorrect answer …. and what the correct answer should be! Our FREE Victim Impact Panel is included with your Level 1 Alcohol/Drug class. After you complete your DUI course, your coupon code is provided. Upon successful completion of your course, you can immediately print or download your Victim Impact Panel Certificate. Our Online VIP is accepted in nearly every city in NV. Be sure to check with your court for credit approval of the online Victim Impact Panel. Other DUI Courses May Require You Go To A Classroom to Take Your Final Exam. ABC Drive Safe’s Level 1 DUI course is 100% online. Take it in the convenience of your home or anywhere there is WIFI. No need to go to a classroom to take your Final Exam. The most convenient part of taking your court mandated DUI course online is that it fits YOUR schedule. Log in and out as often as you like and your place will be kept so you can continue right where you left off. Take it for 20 minutes, two hours or complete it in one sitting, Any time you want to return to your course, just come to this website and click on the student login button The course time is tracked automatically per DMV requirements. Take this course on your Computer, Tablet or Smartphone. . This course is DMV licensed and court approved for first offender Level 1 Drug/Alcohol class. This course is designed to use on all Android and iOS devices. Upon completion of your course you can IMMEDIATELY print or download your Certificate(s) to deliver to your court. Don’t have a printer? FAX it FREE!